Children walking home, being home alone for any period of time, and entering an empty house can pose many safety and security concerns. With a little guidance, rules, and helpful devices, parents can help their family stay safe. With your child, plan a direct route to school or bus stop. Encourage them to walk/bike with friends or neighbors. 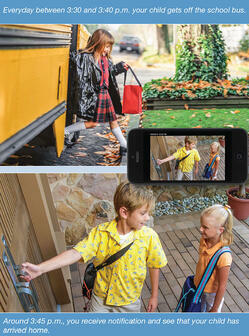 Remind them to be alert, no distractions from cell phone or ear buds when walking. Unless planned ahead, make sure they are coming directly home after school. Establish basic rules for when your child is home alone. Whether they can use the stove or oven, visitors, and screen time. If you don’t have one already, consider getting an alarm system that will tell you when your child returns home from school and many other features no matter where you are. This can includeas little or as much as you desire. Alarm system- child returns home, disarms system with specific code alerting you they returned home and which child. Bonus picture can show you if they are alone or not. Door locks to help avoid lost or stolen keys. The child cansimply enter the code on the door lock, alerting you when the door opens. Sensors placed on sensitive areas such as gun or liquor cabinets will alert you if these are opened. Video Monitoring- Keep an eye on activity whileyou are at work. See when they return home from school. It can become crazy with school and extracurricular activities, with the potential to lose track of where family members are or should be. Create a monthly calendar using an app of each family member events all in one place. If not using the app take a picture of the calendar and share with family so each can have it on their phone. Create social media guidelines and outline the appropriate usage. Warn them about dangers of posting photos or status updates that could lead to unwanted visitors knowing they are home alone. Stay connected to your family and home with Custom Alarm. Check in with live video feeds, receive notifications of activity at home and much more! Interested in getting started? We've created a package with over $1,000 in savings to get your family started with the safety and security you deserve!